At last, Disney released the first posters of the movie adaptation of the hit video game Prince of Persia featuring Jake Gyllenhaal and Gemma Arterton. 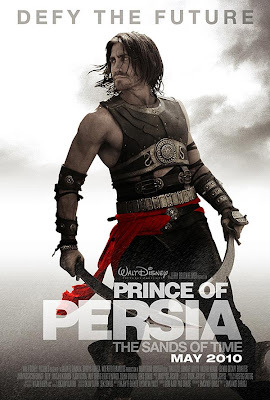 In the movie, Gyllenhaal will play Prince Dastan, a young prince in 6th century Persia who joined forces with Tamina (Gemma Arterton), a princess, to prevent a nobleman from acquiring the Sands of Time, a gift from the gods that can reverse time and allow its handler to rule the world. 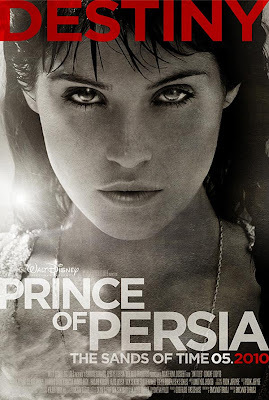 I may not have played the Prince of Persia franchise but I know that this movie will be good. Why? Just look at this credits: Mike Newell (Harry Potter and the Goblet of Fire) and produced by Jerry Bruckheimer. Starring Jake Gyllenhaal, Ben Kingsley, Gemma Arterton, Toby Kebbell, Alfred Molina, Reece Ritchie, Richard Coyle and Steve Toussaint. As much as I like Goblet of Fire, I trust Mike Newell that he will make Prince of Persia Sands of Time a big movie.